In these Posts, I offer ways to manage our Well-Being; how we can thrive in Relationships; be Happy. Let’s engage together on this journey. 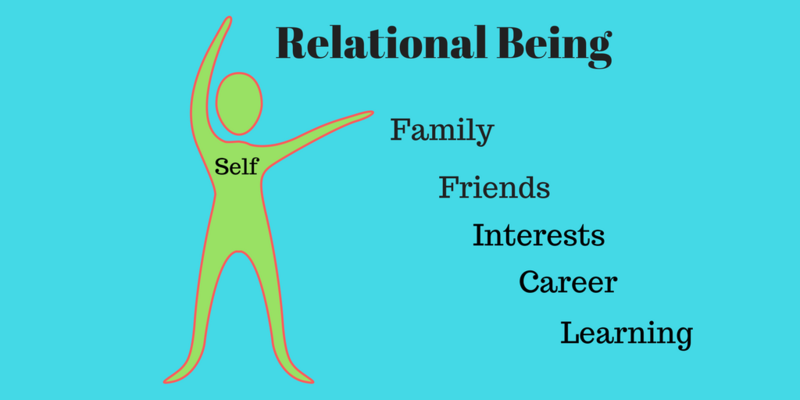 In this Post, I continue to discuss the 5 factors to assist us in Observing how we are performing in our Relationships, being Awareness, Responsibility, Request, Respect and Curiosity. In Part 1, I suggested Well-Being is how we engage in Relationship with ourselves and others. 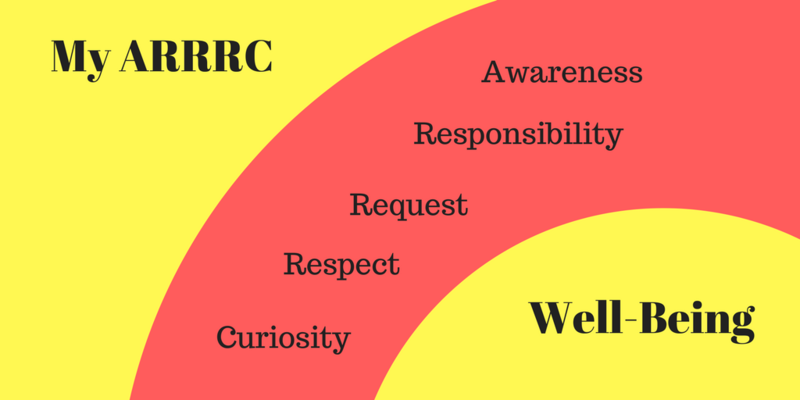 In Parts 2 and 3, I referred to our ARRRC as informing our Well-Being and discussed Curiosity and Awareness. I now discuss Responsibility and Respect. In Part 1, I suggested we have a Responsibility to take care of our Well-Being not only for ourselves but for others, no more so in our roles as Parents and Leaders. The ricochet effect of us not taking care of our Well-Being, not being Aware of how our actions may affect ourselves and those around us, is palpable. Easier said than done, for often we are frozen, our Awareness shut down. In Part 6, I will tell a story of me being frozen under the stress of my sole legal practice until I became Aware how this was affecting Margi and our children, the Well-Being of our Family. With Margi’s support, over time I took Responsibility as a Parent and Partner to remedy the situation. I also suggested in Part 1 that we cannot outsource this Responsibility. In our early years, I relied unduly on Margi for my and our family’s Well-Being. I see this all too often in other families, in my opinion placing strain on the Well-Being of the Relationship. It did on ours, until I stepped up and engaged in Well-Being conversations with Margi. In the worlds I am familiar with, legal and corporate, I see Leaders outsourcing their Responsibility for the Well-Being of their teams to Human Resources as a fundamental cop out having huge repercussions. To repeat from Part 1, in answering the question who do you think is responsible for ensuring wellness is a workplace priority, Mary Digiglio, Managing Partner of Swaab Attorneys has no hesitation: The partnership—there’s no doubt about it. That is not to say HR does not play an important role. However, it must be seen to be a supporting role, at the same time being empowered to resist Leaders who wish to palm off their Responsibility; when a Leader asks what are you doing to enhance Well-Being, HR can emphatically respond, first tell me what you are doing. Many years ago, my CEO was Aware that my stress was affecting me and my team. He suggested I take at least a week off (paid leave) and take Margi out to dinner at “Brisbane’s best restaurant” at the company’s expense. During that week, he called to see how I was. No drama, no paperwork. I have never forgotten this lesson in a Leader taking Responsibility for a team member. As a Leader, I sought to be Aware, and had no issue with a team member taking a day or two off to re-charge when stress took hold: no drama, no paperwork. In taking this action, my CEO was also helping me taking care of the Well-Being of Margi and our children. Seen on this light our Responsibility as Leaders is huge. QUESTION: How do you see your Responsibility? when arriving, say good morning, how are you? (see the good morning effect example in Parts 1 and 2). when receiving work as a Leader, acknowledge it, saying good work and thanks for [staying late]…[over the weekend]…and PAUSE, AND ASK YOURSELF do I really need to make changes? when leaving, say good evening and if applicable ask, do you have to stay late? We all must step up to the plate, be Responsible. Sometimes this take courage. However, if only we action these simple words of acknowledgement and care, we can forget most of the other soft skill wizardry propounded by the Leadership industry. QUESTION: Do you see yourself as a Leader? Responsibility is empowering. It is very much linked to Respect and like Respect, associated with autonomy and trust, being fundamental to our Well-Being. Our children’s mantra of we are the bosses of ourselves still echoes in my ears. I learnt this big time in my first year of articles at a Sydney law firm. My partner asked me to prepare a two-page letter of advice. When I gave it to him, he looked me in the eyes and asked should I read it? For a moment I seized, then responded No. I think it is ok. He signed it without reading it. As a Leader and Parent, I never forgot how this small act of allowing me to be Responsible and accountable for my advice indicated deep trust and gave me a feeling of empowerment. Looking back, the advice was on a minor point. But that did not matter, his action is what mattered. QUESTION: My partner took a risk. Would you? Respect summons us to regard ourselves and each other person as legitimate. It is at the core of effective and empowering Relationships. At my all male, almost all white and Protestant boarding school I referred to in Part 3 we had Respect drummed into us, but I remember it more in the context of Respecting your elders, those with a title. 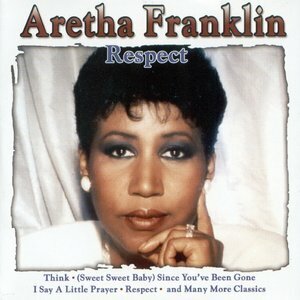 Aretha Franklin’s song, Respect that I heard within the walls of my boarding school gave a wider context for me. The examples I gave above for Responsibility are also examples of having Respect for others. Here I want to emphasise not discriminating for whom we show Respect. As individuals, we are all entitled to be Respected for who we are, irrespective of our age, position, race, gender, sexuality or another element of our identity. Just the other day I saw a widely Respected corporate Leader brush past his PA, almost Trump-like. This so affected me that I quietly inquired whether this was an in the moment action, for we all can be driven by unhelpful moods (I will discuss moods and emotions in a later Post). Sadly, I was told it was not. I will leave it there for now. 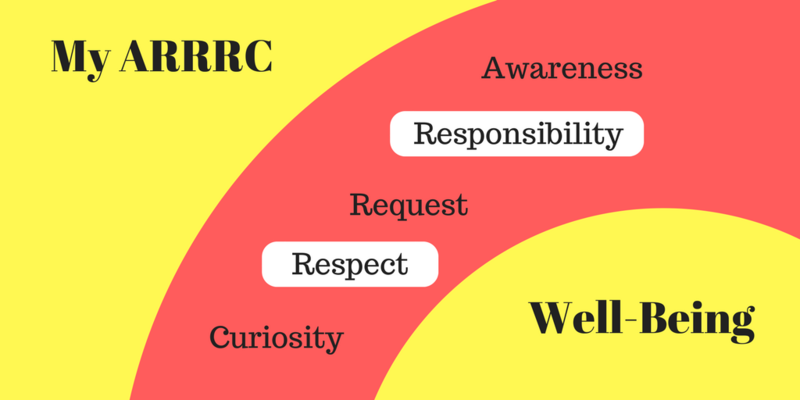 Responsibility and Respect will appear many times in future Posts, as they go the very core of our Well-Being. QUESTION: How do you see Respect played out in your life? In Part 5, I will offer thoughts on the remaining element of ARRRC, Request. In Part 6, I will start to explore 4 factors that help us be in a space of peace and openness, actions that enable us to be Aware of what may be blocking actioning our ARRRC. I look forward to our next engagement. Until then, take care of yourself, your loved ones and your work teams.